To inspire you should impart; To impart you should uncover. 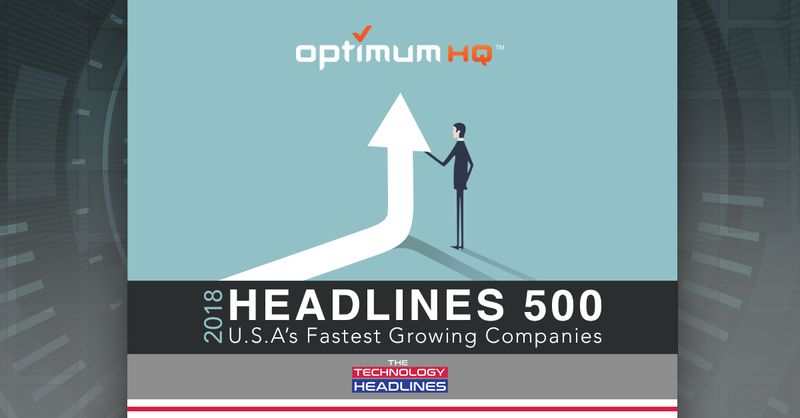 Headlines 500, a list of the U.S.A’s fastest 500 growing companies, inspire and impart you with the list of companies that have made the stride to Success, Growth, and Glory in the year 2018. The annual list represents U.S.A’s premier 500 companies that have contributed to the growth of the economy and nation by bringing in new innovations, solving customers’ problems, and creating remarkable instances for others to follow. Our list of fastest-growing 500 brings to light the companies that have ideally met the standards of our editorial board. Explore the full list and discover the fastest growing companies of the year 2018. One of the estemeed winners is Mesa, Arizona SaaS company OptimumHQ. View OptimumHQ's Headlines 500 directory listing. OptimumHQ is growing rapidly and tripled in size from 2017 to 2018. They are expected to add another 30 talented members to their team by the end of 2019. OptimumHQ is the leading business solutions platform that allows customers or partners to rapidly create custom business solutions for complex business problems. OptimumHQ is for business leaders who are struggling with packaged software and spreadsheets to run their business. OptimumHQ believes that custom software is critical to business success, but companies are getting ripped off by highend software and custom development shops and there are too many nightmare project failures. Unlike custom development and enterprise software, OptimumHQ delivers powerful, custom solutions in days or weeks, not months or years, at a much lower cost and with no custom code. The Technology Headlines is a knowledge platform for industry leaders and professionals to share their experiences, ideas, and advice within the enterprise IT community. We are committed to our readership base that consists of CIOs, CXOs, and CMOs of some of the fastest growing companies.